my neighbors burning bush has something. at the ends of the shoots, the leaves are folded over and there is some kind of sticky/gooey stuff that is holding the leaf over - there are also small black things there (they're not moving). what is it? and how to get rid of them? or are they beneficial in some way?? It sounds like aphids. They tend to cluster at new tip growth and cause leaf curl like that. Safer's Soap will kill them. You may need to respray several times at 3 or 4 day intervals to get them all. i didn't see any aphids. just the black things. 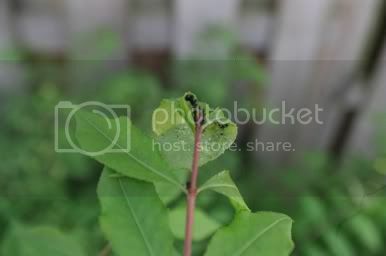 i sometimes get aphids on my rose...they tend to congregate at the base of the stems - not at the ends. or are there different types of aphids? would that fungus cause the leaves to curl over? there's some caterpillar that does that in some tree - this looks basically the same...but there's no caterpillar.